Sister Columba is probably one of the oldest Electric Picnic artists. At 90 years of age, Sister Columba is probably one of the oldest Electric Picnic artists. 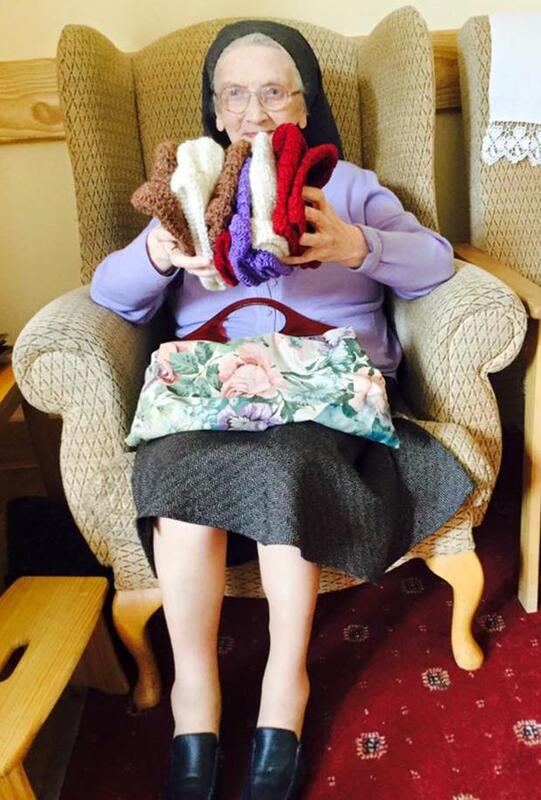 The nun, who is part of the Sisters Of Holy Family Of Bordeaux, and living in Newbridge helped to crochet some jumpers for the trees in the Hazel Wood. While she decided not to head to Stradbally this weekend, organiser of the ‘Kildare Yarn Bombers’ Annie Morris said she was chuckling at the thought of festival goers gawping at the designs. Annie, was part of the 55,000 strong crowd to make their way to Electric Picnic this weekend. Determined to make the most of the three day festival, thousands had set off early arriving at the camp site before 9am. Weighed down with tent poles, yoga mats, beers cans and boxes of Crunchy Nut Cornflakes, people started setting up their temporary homes for the weekend. The number one confiscated contraband item was the make-up mirror, according to security. "One man tried to bring in a three foot mirror and was furious when we took it," a guard said. Some managed to smuggle them through; Emma Murphy (19) carefully glued on false eyelashes outside her tent. "I wasn’t born with these lashes," she said. It was a family affair for Rupert Simonds-Gooding (55) and his wife Nicky who is attending EP with their son Tom and a circle of close pals. "There are ten of us camping in a horse trailer and a caravan. And only one pair of wellies to go around. But we do have tequila," Nicky said. Away from the camp site, performers and artists waltzed about. A giant disco ball began to glimmer on the Boogie Woogie stage, acrobats hoisted themselves into the air in Trailer Park. Things were getting a little "Twin Peaks" in the Hazel Wood where Picnickers wandered passed a woman wearing a giant prosthetic owl head. “Do you want to write your child hood secrets in my shed?” she asked holding out a marker. Near the main stage, 2FM’s Blaithnaid Traecy and Eoghan McDermott flitted about the VIP area while Rugby star Brian O’Driscoll joined friends at the Heineken stage. Tv3’s Ivan Yates was attending the festival for the first time. “It isn’t a patch on the Ploughing Championships,” he said.